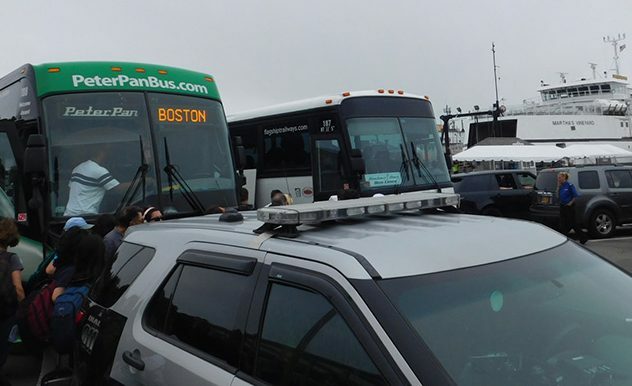 Terminal employees to call Peter Pan if last bus to Woods Hole is tardy. The Steamship Authority has adopted new procedures to address late buses in Woods Hole. At the Port Council Meeting in Falmouth Thursday, the ferry service decided if the last Peter Pan bus is behind schedule to drop off passengers for the last ferry to the Vineyard, Steamship Authority staff will reach out to Peter Pan and find out what’s going on. 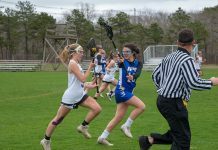 The new policy is in response to a May 29 incident, first reported by The Times, in which Island teenagers got stranded in Falmouth after the last ferry did not wait for a late Peter Pan bus to arrive from Boston. The teens wound up having a difficult time securing a hotel room due to their ages. On June 13, Steamship Authority general manager Robert Davis wrote in an email that the Steamship Authority wasn’t informed the bus was running late. “Although we will hold the boat on the last trip if the Peter Pan bus notifies us that they are nearby, we received no notification from them as to their ETA on May 29,” he wrote. But now the Steamship Authority intends to communicate in the other direction. Now the SSA also has access to the bus GPS system. Dougherty said he personally took the phone call that night of May 29, when the passengers were stranded. They did everything they could to recommend hotels, and brought them back to Falmouth center, where there were more choices, he said. “We felt terrible about it,” he said. Driscoll also said the Steamship Authority is working to expand its list of available hotels to make sure it can suggest options for travelers who are under the age of 21. The bus service makes it clear on its website that it can’t guarantee connections, Dougherty said. Still, they do all they can to accommodate passengers, particularly those trying to make it home to the Islands. “We bypassed Falmouth that night,” he said, referring to a stop near the center of town. Just Thursday there was an incident where an unmarked bus was rented by Peter Pan and the driver left Woods Hole too early, Dougherty said. They were able to contact the bus and have it turn around to accommodate passengers leaving the Island on a ferry that was delayed by fog, he said. 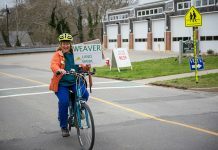 Violet Kennedy was aboard the May 29 Peter Pan bus from Boston that arrived in Woods Hole to find the ferry gone. She considers the policy change a step in the right direction. Kennedy’s friend Kate Sudarsky was also on the bus that night, and was enthused to learn of the policy change. Offshore Engineering president John Packer, who excoriated the Steamship Authority in a June 15 letter over the stranded teenagers, welcomed the policy changes. The Vineyard’s Steamship Authority board representative, Marc Hanover, was advised in Packer’s letter to motivate Robert Davis to institute change. Reached by telephone, Hanover said he did not play a role in the implementation of the new policy, but welcomed the improvement to Steamship Authority customer service. Previous articleAlan Dershowitz — won’t you be my neighbor? Next articleSponsored: Real Estate Confidential — Can you condo?